Kennedy Meadows Resort and Pack Station opened in 1970. It is nestled at the base of where Highway 108 begins the steep climb to reach Sonora Pass. Fire destroyed a good portion of the Resort in October of 2007...including the historic wooden lodge and seven of the cabins. The great news is that the buildings have all been rebuilt and they are back in full swing. The picture above was taken on July 5, 2008. 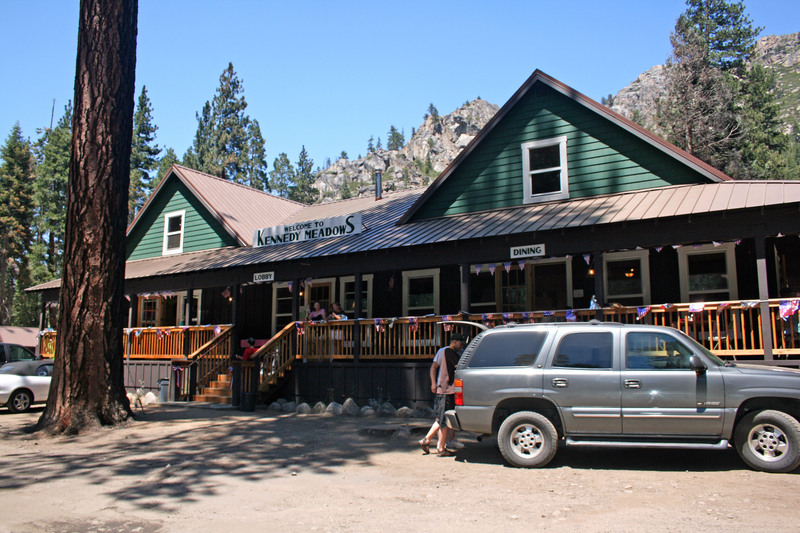 The pack station is one of the more popular ones due to the fact it lies in close proximity to the Emigrant Wilderness. They offer day rides and backcountry horse packing trips. There are also several campgrounds along the Kennedy Meadows Road situated next to the river. Check out the Resort's Web site below to see if reservations are required. As you would have noticed on the ride to the Resort, there are a number of campgrounds along Highway 108 within close proximity to Kennedy Meadows Resort. Please see their Web site to find out more about their facilities. Directions: Kennedy Meadows Resort is located 25.7 miles from the Summit Ranger Station along Highway 108. Turn right onto Kennedy Meadows Road and shortly before the road ends, you will see a parking area for trailhead parking.